The NBA will not suspend Kevin Love for Game 2 of the NBA Finals after he left the bench area during the Cleveland Cavaliers-Golden State Warriors scuffle. Love was already on the court when the fight broke out and took a few steps forward before being pulled back to the bench. The NBA has suspended players for leaving the bench area in the past, but apparently did not deem Love’s actions suspension-worthy. 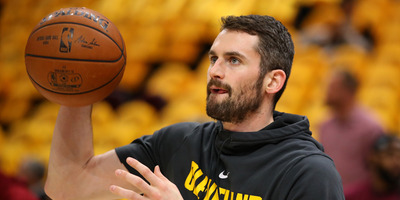 Kevin Love won’t be suspended for Game 2 of the NBA Finals after leaving the bench during a scuffle between the Cleveland Cavaliers and Golden State Warriors, according to Yahoo’s Chris Mannix. Love was potentially in hot water following the Cavaliers’ Game 1 loss when he was standing on the court as Tristan Thompson and Draymond Green got into a shoving match. Love had already been standing on the court when the scuffle broke out and took a few steps forward before a coach pulled him back to the bench. The NBA mandates that players not in the game stay in the bench area during on-court altercations. It’s a rule the league takes seriously to keep fights from escalating, and they have suspended players in the past for violating the rules. It’s good news for the Cavaliers, of course, as they try to rebound from a disastrous blown-lead in Game 1. Love pitched in 21 points and 13 rebounds in Game 1, and his scoring and rebounding will be needed if the Cavs have any hope of recovering.